Bossy Italian Wife : Quick Fix: Veggie Tray! Now before you are all like, "Duh! We know how to cut up veggies!" I want to take a moment to explain. Of course I am fully aware that many of you out there in cyberspace know how to cut veggies. But I wanted to make a quick post about having one all the time in your refrigerator because, while it seems like a no-brainer, it's one we overlook all the time. Access to healthy foods is half the battle. I can't tell you how many times I have had carrots in my fridge and not made them into "carrot sticks." When I do, I find I not only eat more vegetables (like with dip or hummus) but I also put more vegetables on my salads because they are nearly prepared and it's just so much easier. I had gotten out of the habit of doing this for several months, but I just started making up my trays again because this year I am really focusing on living a more well-rounded life. As you can easily imagine, having a blog where I regularly cook is a joy, but I also find that I am eating what I make--so I have to make it a point to eat healthy too! If you've been getting a little off-track lately as the New Year is winding down and our resolutions become, "Eh, I totally tried," this might be just the thing to jump start you!!! Now, of course, you can add to your tray whatever you like. I am starting with carrots because they are just a great veggie for trays. Radishes are another one of my favorites. 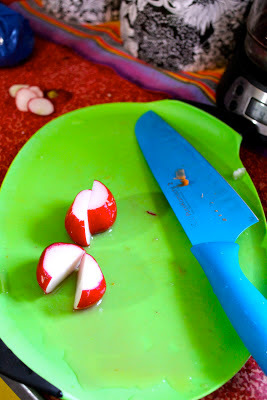 I know not everyone will be as enthused about radishes as I am, but I love their crunch! I also cut up celery, but I was using a green cutting board and I wasn't about to take pictures of a green vegetable being cut on a green cutting board. That would have been silly! Also: put a paper towel (or two) on the bottom of the tupperware you are using and it absorbs the extra moisture in the container, making your veggies last longer! Now you are al set to have veggies whenever you like! 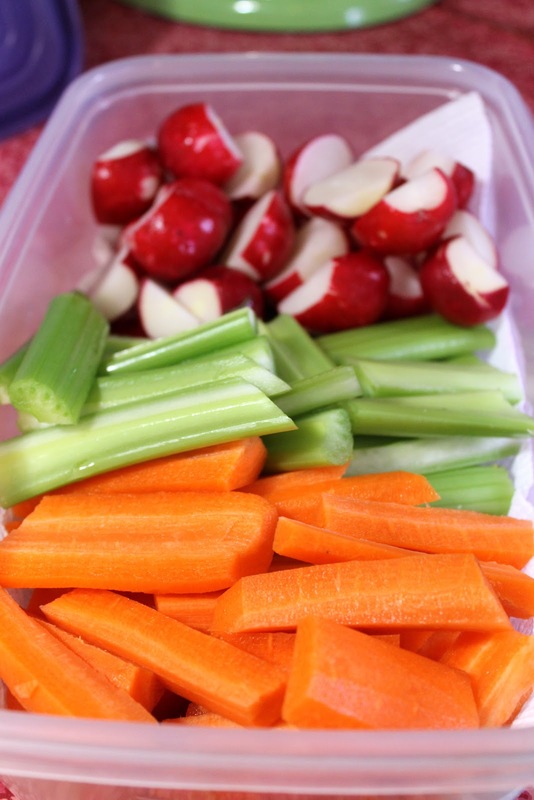 Tell me, what are your favorite veggies for your veggie tray? Do you feel you are doing well with healthy eating habits lately? Leave your comments for in the section below!